Rosemary Cottage is a cozy 3 double bedroom fisherman's cottage. Over 3 floors, on the ground floor you will find a comfortable lounge with an open fire place, this leads through to a bright spacious well fitted open plan kitchen/dining area. The dining area has a table and comfortable seating for up to six people and the kitchen is fitted with modern appliances. There is also a cupboard under the stairs for all your outside garments and shoes. All bedrooms are tastefully decorated to a high standard and all have adequate storage space. 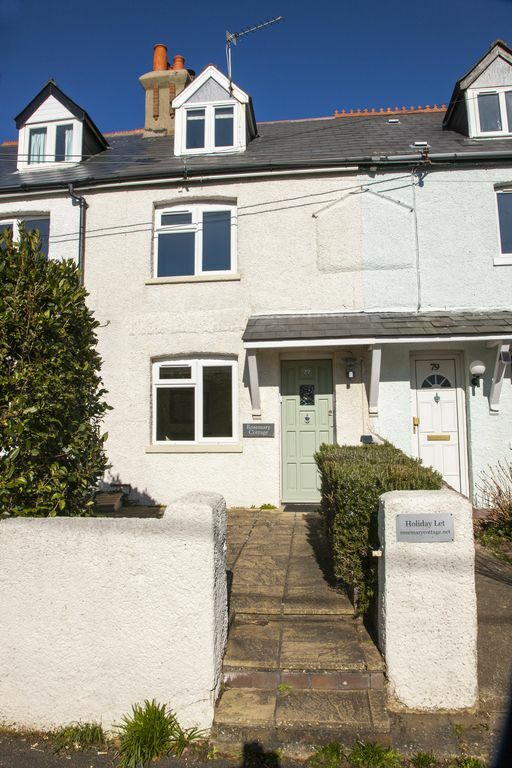 On the first floor, the front bedroom has two single beds and is a bright and airy room, with partial sea views. The back bedroom has a king-size bed with a free standing wardrobe. The family bathroom on this floor is fitted with a large bath and a separate shower cubicle. The third bedroom (Master Suite) on the top floor has recently been extended (now 21ft long) has a double bed and a sea view with the addition of an ensuite shower room. The garden is enclosed with decking, a gas barbeque and a shed for bikes. Street parking is available. Rosemary Cottage has undergone a major renovation and provides cozy and comfortable accommodation for up to 6 people. Is ideally located for walks or bike rides down to the beach, keyhaven marina and to Hurst Castle where you will find stunning views across the solent to the Isle of Wight. There are plenty of pubs and restaurants in Milford on Sea village, which can be reached within a 5 minute walk, with the market town of Lymington only a 10 minute drive away. The Cottage is also on the outskirts of the New Forest. There is a wealth of places to visit and explore in The New Forest from award winning gardens, museums, leisure and wildlife parks and farms plus a lot more. Good friends of ours purchased a second home in Lymington and whilst my husband was helping them with the renovation of their property he went on a bike ride and saw the cottage for sale. It was in need of a complete renovation - perfect project! We were lucky enough to purchase in August 2011 and haven't looked back since. We love Milford-on-Sea and the surrounding area. Everyone who stays leaves heartwarming comments in our guest book about the cottage and the area. You won't be disappointed if you choose to stay at Rosemary Cottage. A large contemporary finished bathroom is located on the first floor. There is a toilet, sink, a large shower cubicle and a bath with separate hand shower. The en-suite to top floor bedroom which will have a toilet, sink and shower enclosure. 100% cotton hand towels are provided. Bath towels provided but please bring beach towels. Please note:- The Cottage has 2 fairly steep staircases with no bannister on top staircase and staircase down into the dining area is open on one side and only has a rope to hold on the other. Children to be accompanied at all times when they are using or are near the staircases. We absolutely loved staying at Rosemary cottage! It was very comfortable, spotlessly clean and very cosy. We stayed over New Year and were pleased to see a Christmas tree in the lounge when we arrived, as well as wine, tea, coffee and biscuits. The rooms are very tastefully decorated, the beds are comfortable and the bathrooms were a little bit of luxury. We have stayed in lots of holiday rentals and this was easily the cleanest. Thank you so much for this wonderful review. We are pleased that you found the cottage clean and comfortable. We are so lucky with the location of the cottage and with it being so accessible to restaurants/beaches and tourist attractions. It is lovely to hear you would like to return one day. Thanks again. All arranged at less than a weeks notice and it all went very smoothly. Key safe for the keys and a very nice welcome pack of wine, sweets, coffee bags , tea and shortbread. Only thing missing was milk but that was readily available in the village. The co-op is open every day till 10 pm. Excellent heating will suffice winter. Good shower but only used one on 1st floor not attic. A bit hot even at its coldest setting. Not sure why since hand basins and kitchen not that hot. Entertainment consists of Freeview tv but also DVD player and some DVDs and books. HDMI port at side of TVs so can use chrome cast or plug in your tablet if you have streaming subscriptions. Photos give a good impression but essentially walk into living room followed by a dining area plus stairs and then the kitchen. On the 1st floor two bedrooms, a double and two singles plus large bathroom with shower and bath. On the next floor or loft conversion is a 2nd double bedroom with ensuite shower room and this is the room with a view towards the needles. Helpful neighbour Jenny who introduced herself on the first day. There is a dining table for 6 and the kitchen is reasonably equipped to self cater. Only just enough knives and forks for 6. Most of food shopping can be done in Milford with the Co-op (open till 10 pm) and Hollands (open till 8 pm). There is also a very nice fish and chip shop and a number of eateries plus 2 or 3 pubs also doing food. Nearest large supermarket is a waitrose in Lymington. Plenty to do and visit in the area even in winter. Downsides; Only one bedside table & lamp per bedroom and no instructions on what can be re-cycled in the white bags. Website payment worked well and security deposit returned after a couple of weeks. All in all an easy way to book. Delightful holiday accommodation equipped with everything you could need. Tastefully decorated and furnished. We had a great week and hope to return. Thank you so much for your kind review. We are delighted that you enjoyed your stay at the Cottage and that you would considering staying again. We had a lovely time at the property. It was perfect for our family, and the location was brilliant. We would absolutely come again. Thank you so much for leaving this review. We are pleased that you all had lovely time. We are lucky with the cottage and the location that it is in as it does give you many options of places to visit. We are also delighted to hear that you would consider staying at the cottage again. Thanks again. Clean modern property within reach of many wonderful places to visit. Very comfortable and convenient for exploring the new forest and even the Isle of Wight. Lots of lovely walks along the coast and inland. Milford-on-Sea is a lovely friendly village with a good selection of pubs and restaurants and two convenience stores. Would definitely recommend a visit. Thank you so much for this review. We are glad you enjoyed your stay and managed to explore the area and as you say is easy to do with the cottage being in such a great location. A lovely comfortable cottage beautifully decorated. Thank you for leaving this review. We are glad you enjoyed Milford on Sea and your stay at the cottage. We are lucky to be in a great location with so many places to eat and drink in walking distance. Milford on Sea is a picturesque village on the outskirts of the New Forest and is ideally situated just a short walk from the beach and Keyhaven marina where you can enjoy nature reserve walks, the sunsets and spectacular views across the Solent. You will also be able to pay a visit to Hurst Castle which is at the seaward end of the spit. Just a 5 minute walk into the village, you will find the historical village green. In and around the village, there are plenty of shops and you will be spoil for choice with where to go and eat as there are some excellent restaurants, pubs and traditional tea shops and cafés to choose from. There is always plenty to do, this may include you enjoying cliff top and forest walks, bike riding, visiting the local sanding beaches, country rambles, bird watching, sailing, fishing and kite surfing. The village itself has many activities going on during the year which are very popular with the villagers and holidaymakers alike. Beaulieu Motor Museum and Bucklers Hard are among places to visit or a day trip to the Isle of Wight is just a short ferry crossing away from Lymington. Mudeford, Christchurch and Bournemouth are only a short drive away. Weekends and Mid-week bookings available on request during low/mid season subject to availability (3 night stay minimum) Includes central heating, hot water, 100% Egyptian cotton bed linen and 100% cotton hand towels. Change-over day is Saturday 25% holding deposit taken on booking.